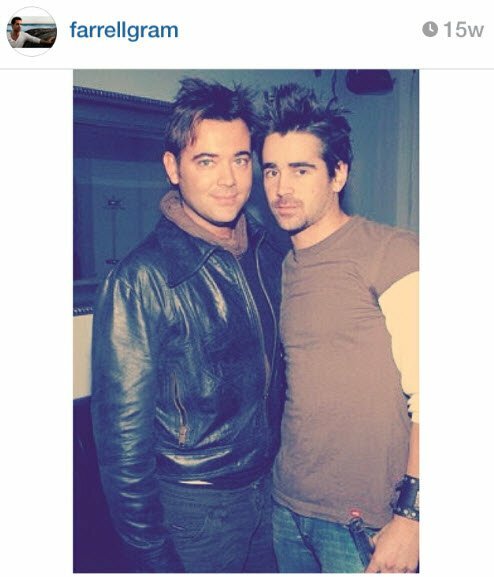 Guaranteed goosebumps: Colin Farrell's letter in support of his brother's gay marriage. 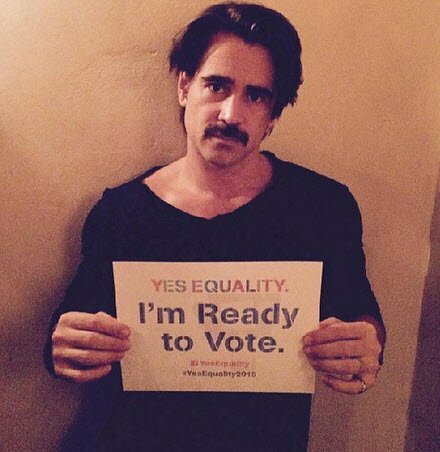 Bless your Irish cotton socks, Colin Farrell. The lovely actor has published an article in Dublin’s newspaper Sunday World asking his country to vote in the referendum and support marriage equality. It’s a subject close to Colin’s heart, because his big brother Eamon is gay and married to the love of his life. “My brother Eamon didn’t choose to be gay. Yes, he chose to wear eyeliner to school and that probably wasn’t the most pragmatic response to the daily torture he experienced at the hands of school bullies,” writes Colin. Colin, 38, is based in Los Angeles. He served as best man at Eamon’s wedding to Steve Mannion in 2009 in Canada. Ireland, if you can hear us, please: Vote for marriage equality. 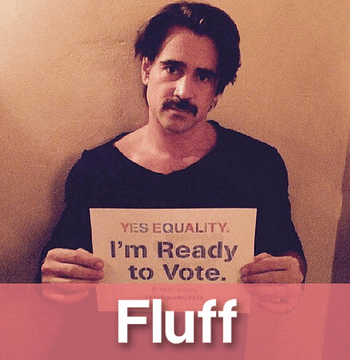 BUT ALSO, vote Colin Farrell in as Prime Minister, or King, or whatever you can do. Top of the morning to you. I’ve been fortunate enough to never have any issue with the idea of gay union. I think I found out my brother wasn’t grovelling in heterosexual mud like most boys our age when I was around 12. I remember feeling surprised. Intrigued. Curious. Not bi curious before you start getting ideas. And this is why the forthcoming referendum is so personal to me. It’s about inclusion. It’s about fairness. It’s about giving our lesbian and gay sisters and brothers back a right that should never have been stolen from them in the first place. Speaking out in support of equality in all its forms is a moral necessity if we’re to have a society where peace, compassion and kindness become the ruling classes. Only love in action can stamp out the wilting toxicity of the intolerant among us. Only ink on paper can truly prove that the Irish people are who we’ve held ourselves proudly to be – a people who, in the majority, are deeply feeling and have a natural and abiding lean towards inclusion and fairness, heart and hospitality. This referendum is a chance for us to arise. To wake up to the conviction that true love from the heart of one being to another cares not for the colour, nor the creed, nor the gender of who it chooses to share that path with. 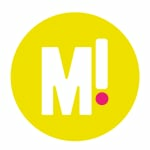 We have a chance to effect a change that’s about recognising no one love is greater than another by virtue of tradition. We have a chance to simply tip our hats to love in all its kaleidoscopic and majestic forms. I’m not sure if I can vote online. As I write this in my bed at 2am I realise I’ll have to check that out. If I can’t, then these words stand as my testament to what my heart believes. Eamon did not choose to be gay, no more than I chose to be straight. It’s all a trick, a sleight of nature. I can jump into my car now, drive four hours to Vegas from Los Angeles, get drunk and meet a woman and have Elvis marry us for $200. And yet in many states in America, if I were gay, I couldn’t marry. In Ireland, a gay couple who wish to share their lives together, who wish to make that ultimate declaration which strikes the fear of God into some of us, are legally not permitted to do so. It’s time to right the scales of justice here. To sign up and register to vote next year so that each individual’s voice can be heard. So that future generations will know that there was a day when the people of Ireland staked claim once more to their independence and that we chose to live independent of inequality. This for me is all about the heart, not the gender. If it’s about the idea of love between consenting adults, then this referendum is as much a heterosexual issue as it is a gay issue. It is for all of us that civil marriage equality must be realised. There are too many things that divide us as a people, let not this be another one. Let this be about not only the matrimonial unity of a man and a man or a woman and a woman, but let it be also about the unity of a community, the unity of an island which has at its heart a gold that this vote speaks to.